This purchase will be a physical gift card that comes to you in the mail. That's right, straight to your mailbox, snail mail style! If you're ordering this item as a gift, give yourself a lead time of 7 business days, and near a major holiday, 10 to 14 business days. Happy day! Happy gifting! What a thoughtful selection! This gift wins. 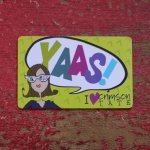 Gift Cards can be applied to all fabrics, notions, classes, and gift items at crimsontate.com and at our brick & mortar store in Downtown Indianapolis.